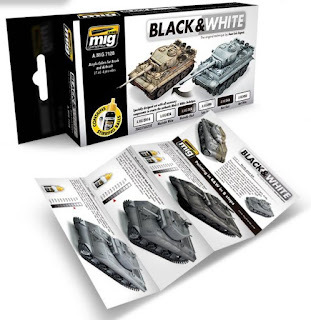 MiG’s AMMO brand has some new products just released – from the Weathering Magazine to a black and white set to some realistic miniature plats to a green set for mechhas - Let’s see what’s new…. 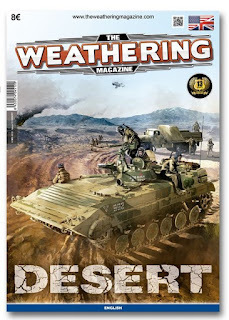 The Weathering Magazine #13 - "Desert"
As always, the magazine explains detailed articles with "step by step" how to execute each technique, illustrated with high quality photographs and concise descriptions of some of the best modellers in the world. Printed on high-quality glossy paper, TWM is full of useful techniques collectable resource and a great source of inspiration. Acrylic water based paint set for creating the original and famous Black & White technique created by Jose Lopez. 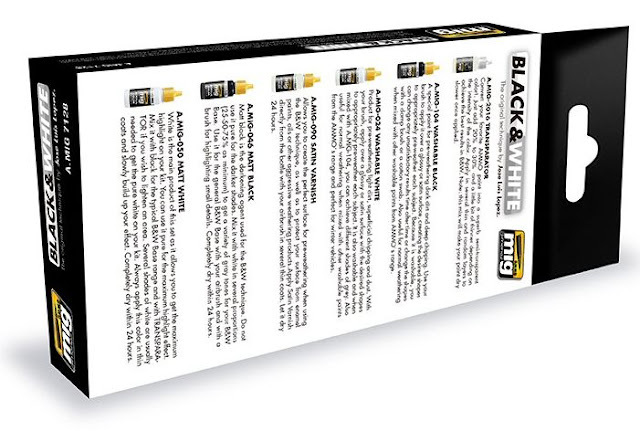 This innovative set is designed to create the Black & White technique, creating realistic highlights and shadows as well as dramatic lighting effects with this definitive acrylic colour set. 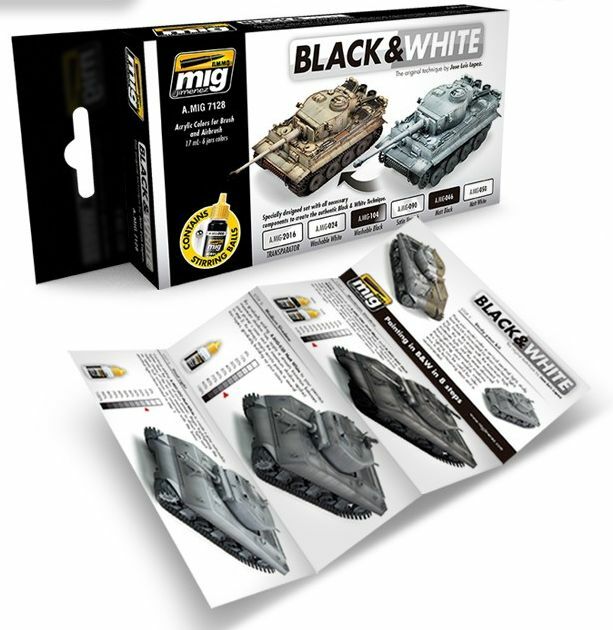 This set includes a leaflet which will teach us how to do this technique with included products: the brand new A.MIG-2016 Transparator, necessary for semi-transparent base colours, both A.MIG-0046 Matt Black & A.MIG-0050 Matt White for grey tones ranging from charcoal grey for shadows through to light grey for highlights, A.MIG-0024 Washable White & A.MIG-0104 Washable Black for weathering dust, spills, chipping, and streaking, and A.MIG-0090 acrylic Satin Varnish necessary for protecting our effects. Each acrylic colour features AMMO steel mixing balls, shake well before use. 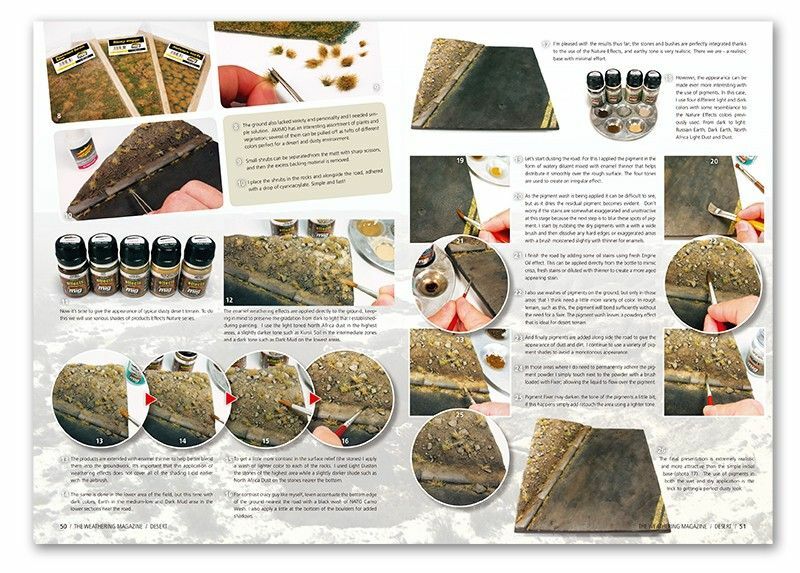 Acrylic colours can be used with brush or airbrush. 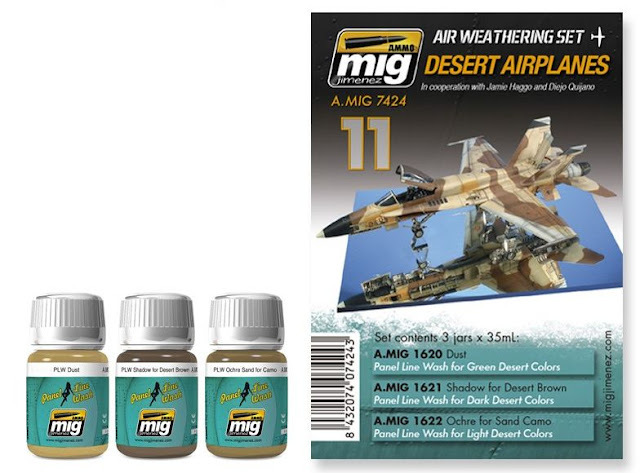 We recommend MIG -2000 Acrylic thinner for a correct thinning if necessary. 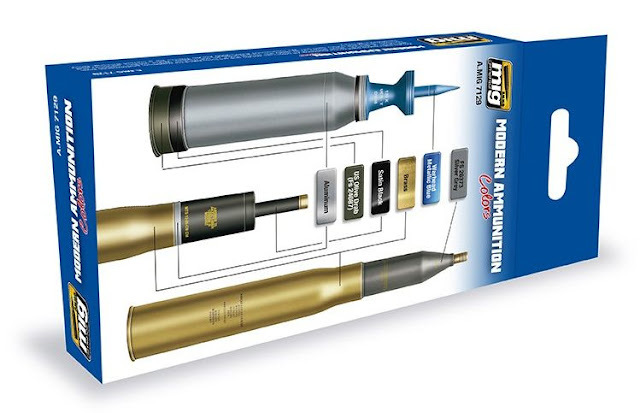 A basic set for all kind of modern munitions dating from the end of World War II to present. Includes the accurate colours for ammunition of different colours like metallic blue, green, black, aluminium or brass cartridges, etc. 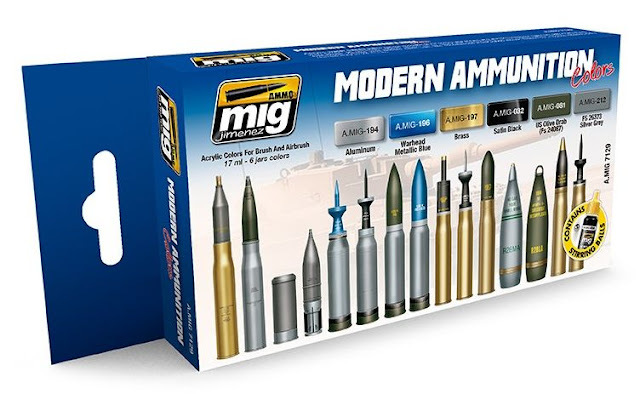 For example aluminium cartridges with metallic blue projectile from Abrams or Leopard, artillery rounds for M109, 2S3, as well as Russian tanks such as T90, T72, etc. 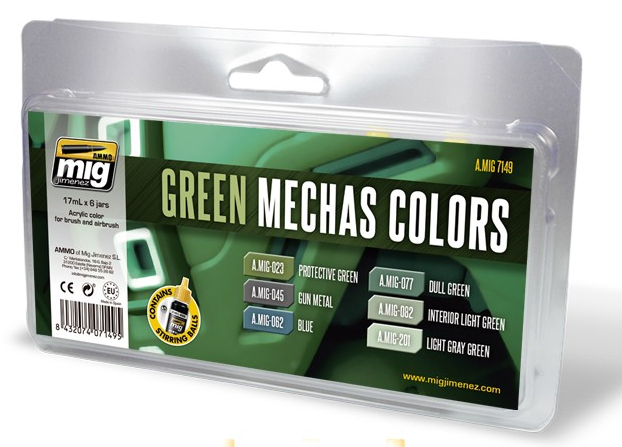 Check your book references or the web to paint your ammo in the correct colours. 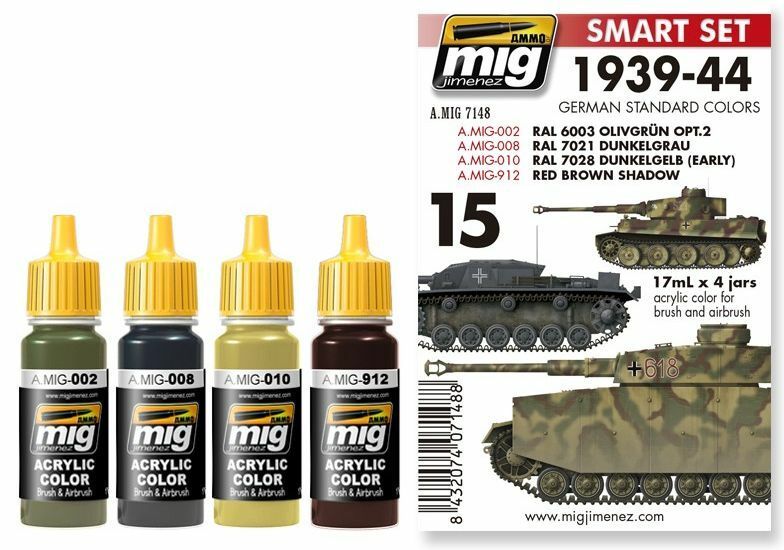 Three metal tones included, with a formula that provides an outstanding finish which was only attainable before using lacquer paints, now available with AMMO odourless and non-toxic acrylics. Each jar includes a stainless steel agitator to facilitate mixture. 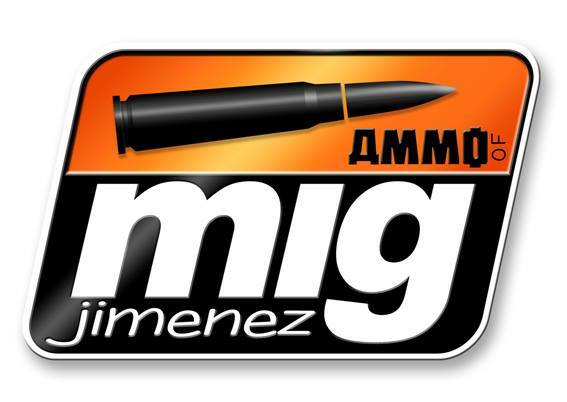 We recommend MIG -2000 Acrylic thinner for a correct thinning. Dries completely in 24 hours. Water soluble, odourless and non-toxic. 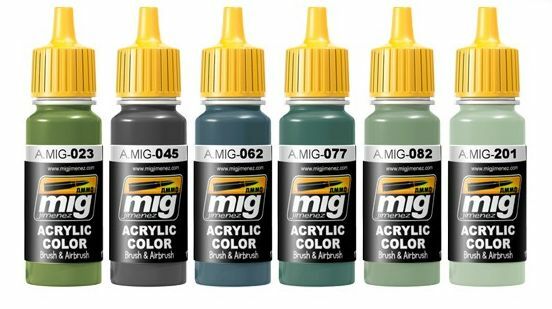 A.MIG-0194 Aluminium - New Colour! 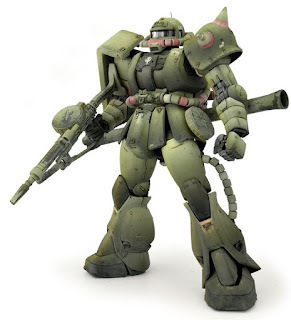 A.MIG-0196 Warhead Metallic Blue - New Colour! 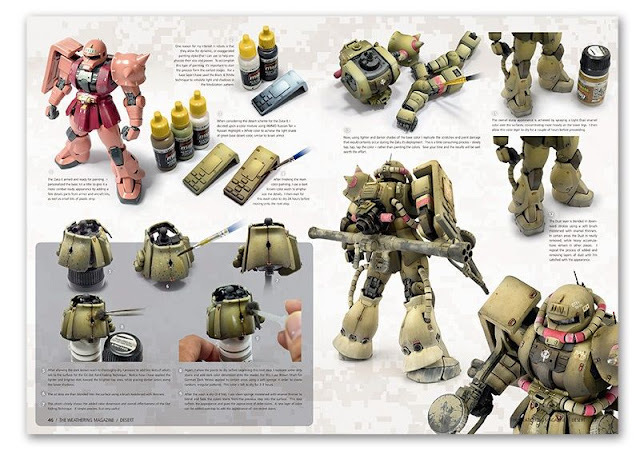 A set specially designed for Mechas and other sci-fi subjects. This set contains six colours for some of the most popular Mechas, for example Zakus. Exclusive set includes 4 different shades of green, perfect to add interest and different colour tones to each plate, a blue and an acrylic gun metal. 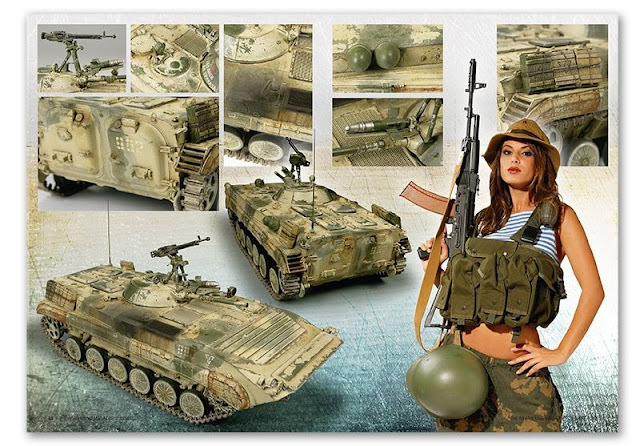 Accurate colours formulated with this modelling genre in mind. Water soluble, odourless and non-toxic. Shake well before each use. Each jar includes a stainless steel agitator to facilitate mixture. Dries completely in 24 hours. Set washes panel lines of all types of aircraft in a desert setting and also for green aircraft such as the P40 Warhawk, Chinook, Apache, UH60, etc. 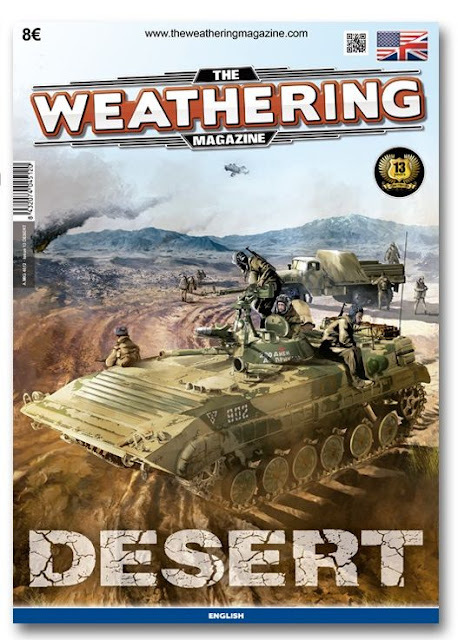 painted in green with accumulations of dust. This set is also perfect for other models and themes such as science fiction or civilian vehicles in a desert or dusty atmosphere. It includes 3 colour line Panel Line that will allow us to easily Wash outline those models with different strengths in each area. 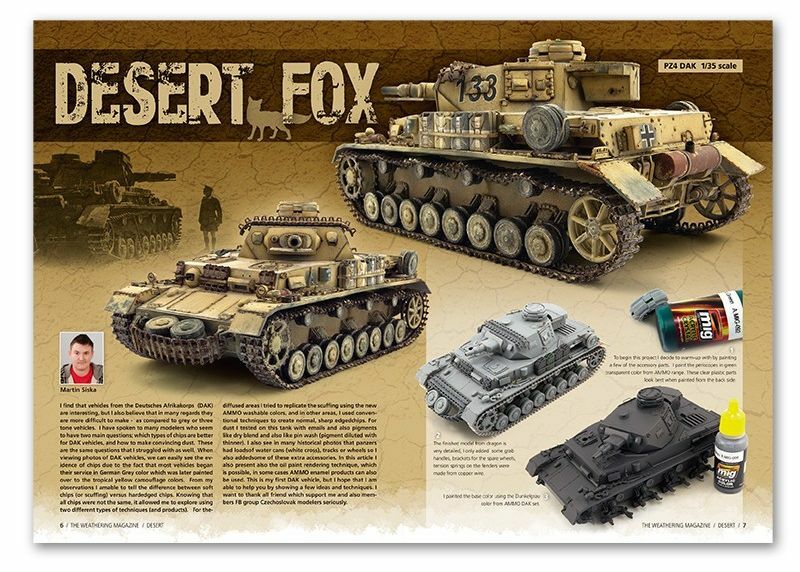 There are still many modellers who are led to believe that the German colours were not the same throughout the war. Some colours were changing and modifying throughout the war, such as the famous Dunkelgelb or "Dark Yellow". Also Olivgrün was undergoing changes. This set includes the four most common colours used between 1939 and 1944, allowing us to obtain greater realism with the most accurate colours, the result of years of professional research. 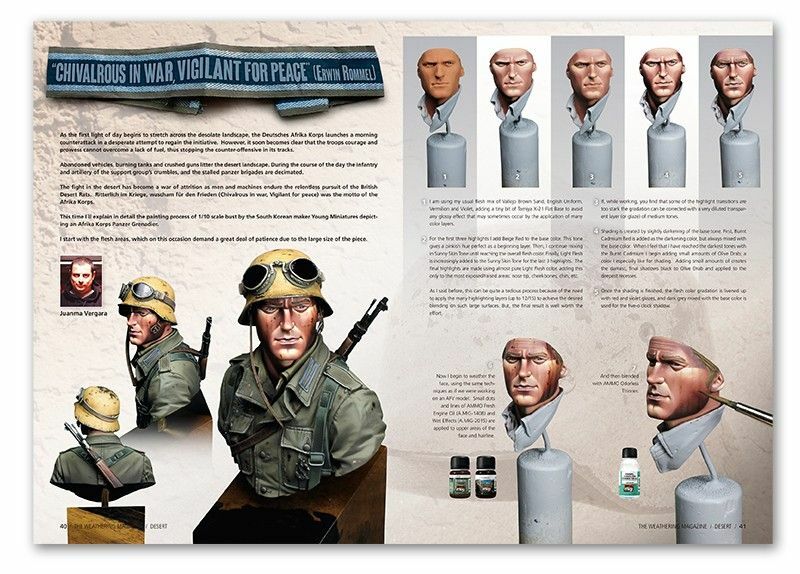 The four colours are acrylic paint with a formula optimized for maximum performance both with brush or airbrush and downscaling effect that will allow us to get the right colour in our models. Each pot includes a stainless steel stirrer to facilitate faster and blended. Presentation 17ml cans. Soluble in water, odourless and nontoxic. Shake well before each use. We recommend A.MIG-2000 Acrylic Thinner for proper solution if necessary. Completely dry in 24 hours. Broadleaf plants cut with super realistic and detailed laser paper. 18 plants included. 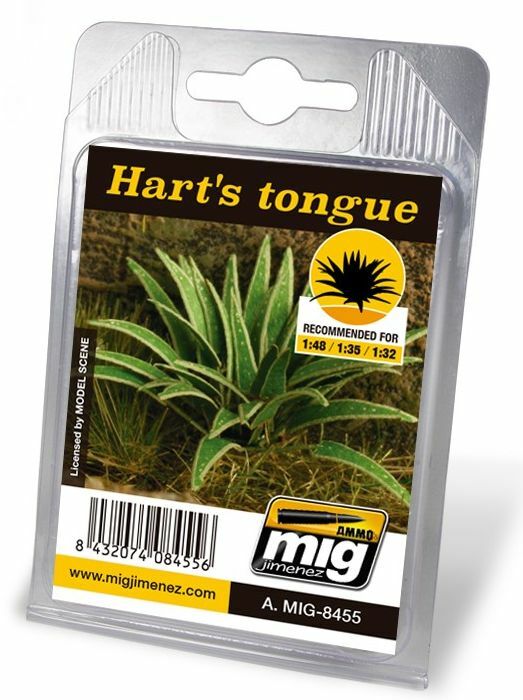 These plants are perfect to add a final touch of realism to your dioramas, vehicles or figures. Their size makes them perfect for scales 1:48, 1:35 or 1:32. Common weeds in paper cut super realistic and detailed laser. 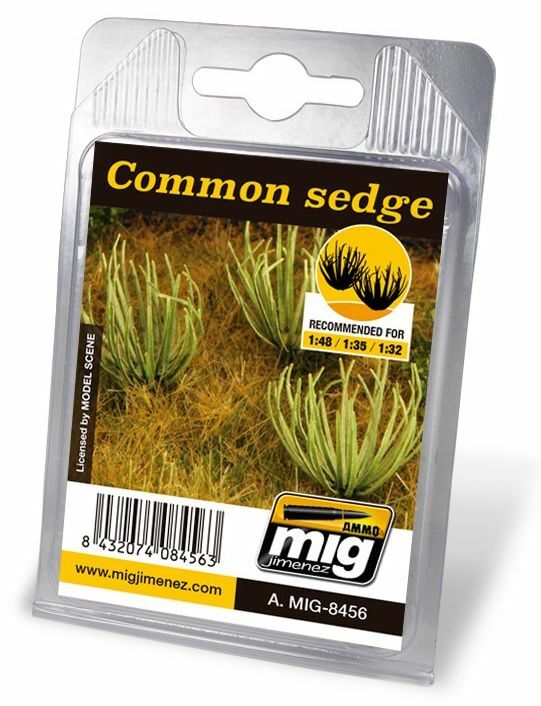 These plants included 18 plants are perfect to add a final touch of realism to your dioramas, vehicles or figures. Their size makes them perfect for scales 1:48, 1:35 or 1:32. Ferns dry paper cut super realistic and detailed laser. 18 plants included. 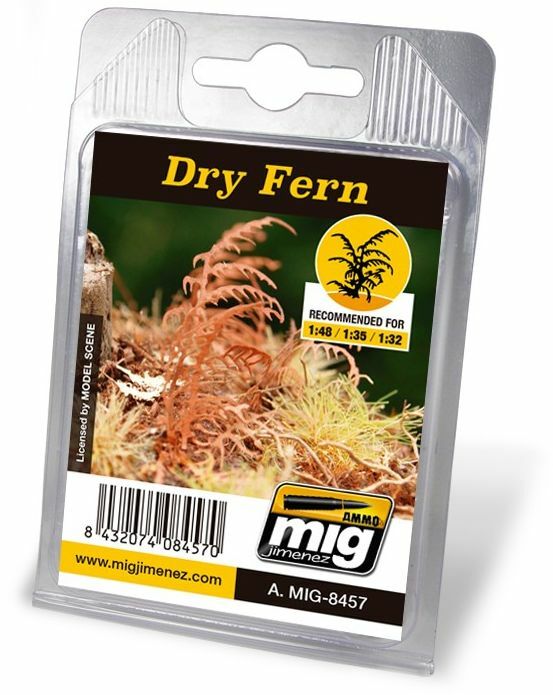 These plants are perfect to add a final touch of realism to your dioramas, vehicles or figures. 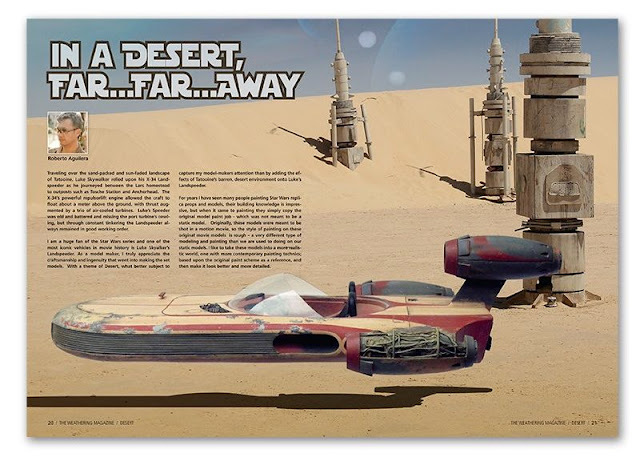 Their size makes them perfect for scales 1:48, 1:35 or 1:32.